Half a piece of boneless Iberian ham shoulder. 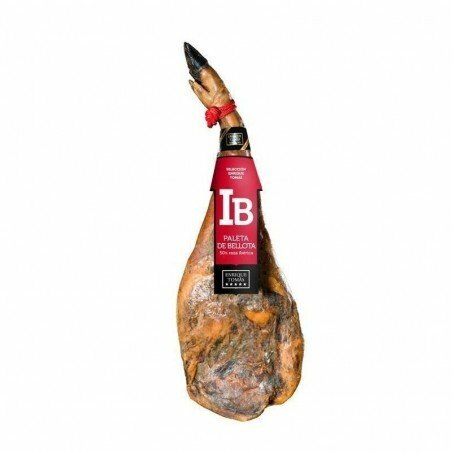 This ham shoulder piece comes from an Iberian breed pig that has been fed with acorns and wild herbs during the Montanera-season. 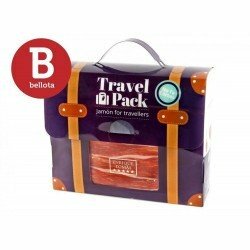 An intense flavour that will not leave you indifferent, the Iberico bellota ham shoulder has no comparison. What is a Paleta (ham shoulder) and how is it made? A shoulder is the result of curing the front leg of a pig in salt. Its taste is more intense than that of jamón because there is the same amount of bone and much less meat than in a jamón. It needs less months of curing than a jamón. Once we have the pig's leg ready, the first thing we have to do is prepare it for salting. The cook makes a v-cut on the pig's rind and decides how much external fat to leave. The more fat it has, the less salt it will absorb and the sweeter it will get. Once the previous operation has been performed, the leg is buried in salt for an average of two weeks. If the chef decides to extend this period, the ham shoulder will be tastier. From that moment on, depending on the type of ham shoulder, we are going to make, the characteristics of the leg and the flavour we want to obtain, the leg will be hung in the special cellar until it is optimum for consumption.